Why do some condo strata corporations allow for smaller dogs but not larger ones? I don't know. If you're going to invest in a dog bed, crate, bowls, food, toys, leash, licence, brush, and vet bills I don't think the size of the dog makes much of a difference. It's more of a lifestyle choice. If you're an outdoorsy, hiking, biking beach-going 30 year old, a bigger dog might be perfectly suited to your lifestyle. If you're 80 with arthritic ankles and waiting for a hip op, then perhaps a toy poodle is the right choice. The owner should be able to pick the dog that's best matched for their lifestyle, not the knitting club that calls itself a strata council. I'm referring to the physical space of a small apartment. Keeping a large active animal in a small condo while you're out all day must drive them nuts. At least a small dog doesn't feel like they're stuck in cramped quarters. A lot of big dogs do well in small spaces providing they get good exercise outdoors. I know someone who once had two Great Danes in a downtown Vancouver apartment. Again I think it comes down to the type of dog and the lifestyle of the owner rather than some strata councillor's preconceived idea of what is acceptable. I worked for someone who brought their dog into the shop every day. The retriever barely spent time alone at home. I personally wouldn't want to leave a dog at home for 8 hrs plus commute time, but that doesn't put me in a position to decide what other people should can and cannot manage. I was involved in a situation a few years ago where a council member fought to amend the bylaw to restrict dog size to "small or medium." Then she abruptly sold her unit! 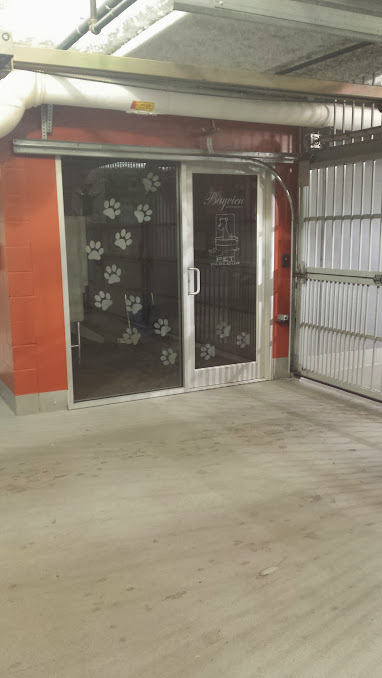 On another note, here at the Bayview One we have a "Pet Parlour" with various dog grooming equipment. Some of the biggest dogs require the LEAST amount of exercise - Great Danes being the perfect example (as a previous poster brought up already). I suppose stratas and rules have their place - but I cannot imagine spending ANY money on something I then supposedly OWN yet have a million restrictions placed upon me... what colour Xmas lights (or ANY Xmas lights) I'm allowed on my door, what window coverings I am allowed (although this is one rule I wish ALL stratas/condos would adhere to because otherwise the buildings' exteriors look ridiculous). 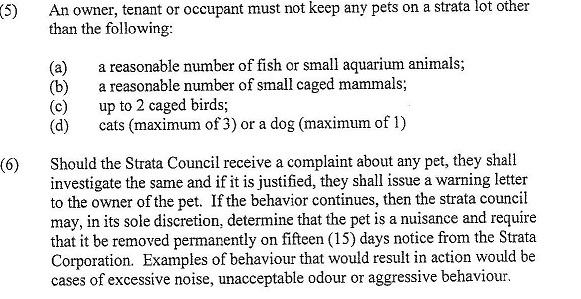 I could *maybe* see buying into the rules of a strata/condo once I had no kids, no pets, and - well - no life. yes, as a condo-dweller I have no life. I do not socialize with my family and friends, care for my pets, read books, travel or do anything other than sit in my unit and complain about the neighbours. One day, people will figure out that the main difference between living in the suburbs and living in a condo is that condo owners don't have to spend hours every weekend keeping their yard up to standard. Our building has a variety of dogs, in all sizes. I haven't noticed any great wear and tear on the building. The dogs and their people are out and about on walks, hanging with their neighbours all the time. I've actually thought a dog would be a great thing - you certainly get to know your neighbours that way. "A million restirctions" are not enough for some single family neighbourhoods (and the better ones too). Large boats in the driveways, RVs parked on the street, fences falling down, illegal suites in the basements, 6 cars, un mowed and in some cases unseeded lawns, driveways with weeds, god awlful colour combinations , (when finally painted after 20 years) - and this was in Gordon Head near the University. I have lived in Condos and single family homes and for me a Condo is much better and I can't wait to get back to one where there is a sense of organization. Oh and by the way when we previoulsy lived in our condo we travellled more, spent less on monthly property maintenance issues, socialized more, never had a problem with our neighbours, their pets or their kids. Condo living for us!! Oh the humanity! God forbid not every house is painted beige. Thank god for neighbourhoods with non-militant restrictions. Nothing worse than the "no hanging clothes to dry" type bylaws. Oh and by the way when we previoulsy lived in our condo we travellled more, spent less on monthly property maintenance issues, socialized more, never had a problem with our neighbours, their pets or their kids. Condo living for us!! It certainly is the future in Victoria. The number of projects sprouting up is mind boggling. Perhaps their neighbours are driven nuts too if the dog's a barker. Since this isn't happening when the owner's there, they may be slow to 'respond' to concerns. And not just big dogs, lonely small dogs can as big a noise nuisance to neighbours while the owner's out. And that's why you have noise bylaws to deal with the barking. An outright ban is the nuclear bomb/kill a fly approach. We are looking at condos/townhouses to purchase in our retirement. We have looked at several so far. Is there some type of 'central registry' which lists the pet restrictions of each building? I guess not, we'll continue to ask every realtor if they know the specific wording as Nparker posted. Are you looking to have a pet, or get away from them? I lived under lemurs. That's not recommended. At the time I wished there was a lemur registry, like the bed bug registry webpage. ...although... Lived Under Lemurs would be a great name for a rock band! Or a tombstone engraving. "He lived under lemurs until the very end". We would like to live in a building that allows cats and dogs, not sure about the lemurs! ... Lived Under Lemurs would be a great name for a rock band! Please advise if you hear that LUL will be performing locally, especially if it's a double bill with Death Pies. Stay far far away from my building then! There's an unhealthy hatred of all things fuzzy here. My strata allows both. Two of the former, or one of each, but not 2 dogs. No size restrictions. Does that include 20-something hipsters? We've got quite the collection of local bands starting to form. I heard one at work the other day: Pat Bay and the Malahats. 20 something hipsters might be the only ones who can save this joint now.